Once again, it was rather easy to get J.T. McDaniel to sit down for an interview. His newest book, Bacalao, was published in July 2004, so he’s still in publicity mode, which includes talking to the press and other interviewers (including this one). Interviewer: So this is the book cover photo on this page, right? JTM: Yes, the back cover author photo. 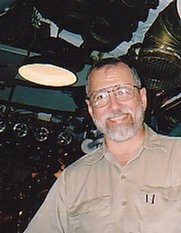 It was taken by my younger son, William, during a visit to Cleveland in 2003. The one on the book is cropped a little tighter. Interviewer: Taken aboard the U.S.S. Cod? JTM: Right, in the after torpedo room. Interviewer: Bacalao is Spanish for cod. Is there any connection between the history of the real sub and the sub in your novel? JTM: Other than the name, not much. There’s a technical connection, as both boats are Gatos. When Bacalao’s crew is moving around the boat, the interior arrangement described is taken from Cod, with some modifications for the time period. JTM: The periscopes are different. Being an older boat, and not having the late war modifications, Bacalao’s periscopes are operated by drum and cable hoists instead of the hydraulic type found in Cod’s conning tower. Cod also has a more modern deck gun, a 5”/25, instead of the 3”/50 and 4”/50 mounted on Bacalao. Interviewer: You don’t say so in the book, but I get the impression that it begins in Cod’s parking lot in Cleveland. JTM: It does. The people there recognized it immediately from the description. The book only spends a couple of pages there, or course, before flashing back to late 1940 for the start of the main story. Interviewer: And the book was launched in Cleveland, too, as I understand it. JTM: Correct. We had a signing, more or less a release party, on 21 July 2004, at the Cod. JTM: We sold some books. Cod got the money. I met some interesting people in the process, including one guy I’d known for a while from an Internet submarine site, but never actually met. After the signing was over, I got to climb up into the conning tower, which is one of those places they don’t usually let the tourists go. They cranked up the Torpedo Data Computer and ran some mock attacks. (Note: Cod has one of only two operating TDCs; the other is in Pampanito in San Francisco.) Took a look through the periscope, too, but about all I could see was a car parked over at Burke Lakefront Airport. Cod’s periscopes are kept raised, and if you don’t raise and lower them frequently they tend to get very hard to turn. Interviewer: One of the characters in the novel, Ohara, who speaks Spanish, comments that Bacalao is being mispronounced. Is it? JTM: The correct pronunciation is Bah-kuh-lao, but I’m simply presuming that the average American sailor of the period would have pronounced it Back-uh-lay-oh. This is based, at least partly, on the fact that, our Navy, Gato had always been pronounced Gate-Oh. Ohara has a degree in Spanish Literature, so he knows better. Interviewer: Are you in this story? JTM: I think Lieutenant Commander Ames probably looks a lot like me. My mother is an Ames, with the family mostly coming from the Decatur, Illinois area (they seem to have originated in Wisconsin), so I presume that Fred Ames, who is also an Illinois native, is probably some sort of cousin. If someone wants to make a movie, I’d be available for the part. Interviewer: Do you think that’s likely? JTM: That they’ll make a movie, or that they’d cast me as Ames? JTM: I think the movie getting made would be more likely. Producers rarely think a character looks like the book’s author imagined him. I may think Ames looks like me, but someone out in Hollywood will probably think he looks more like Tommy Lee Jones. Mind you, if someone wants to pay me enough for the film rights, I’m not going to get too upset unless they cast someone totally inappropriate for one of the parts. Interviewer: What would you consider inappropriate? JTM: Oh, someone too far outside the proper age range, or indulging in anachronistic casting. Will Smith might make a good Miller, but the fact is there were no black officers in our Navy in 1940, and the only blacks on submarines then were stewards. It may not be fair, and from our viewpoint today the whole idea of that sort of segregation sounds stupid, but that’s the way it was at the time and casting a movie without regard to that would just be historically wrong. Interviewer: Even when what makes it look right is really what’s wrong? JTM: Even then. History is history, and you don’t lightly change reality for the sake of modern sensibilities. In the story, everyone is as you’d expect for the period, which means most of the characters are white guys. Interviewer: How real is the story? The History Channel is always doing their “Hollywood or History” shows. (Note: Yes, there actually was some genuine history on the History Channel back in 2005, odd as that may seem today. [Oct 2017]) How does Bacalao fare on the “Literature or History” scale? JTM: Somewhere in the middle, I suppose. Bacalao is present during the Pearl Harbor attack, which isn’t historically correct for that class of boat. The first Gato didn’t arrive until February 1942. It was something I needed for the story, so I fudged a little. Other things are accurate enough, such as the problems with the Mark 14 torpedoes. Certain events, while not 100% accurate, are modeled on things that happened to real subs. JTM: A couple. Admirals Withers, Lockwood, and Christie are mentioned, though only one of them has a speaking part and that’s no more than a few lines that would likely be said by anyone holding the job of ComSubPac. The event involved happens during a time when Lockwood had that job, so presumably it’s him. A couple of characters are named after friends of mine, too. Obviously, the name is the only connection in those cases. Interviewer: The book has been out for a while now. How has it been received? JTM: Pretty well, actually. What makes me happy is that the old submariners, particularly the ones who served in diesel subs, seem to like it. One old-time torpedoman’s mate said it was the most technically accurate sub novel he’d ever read. JTM: I hope so. I have an advantage, of course. Since I was writing in the early 21st century, long after the United States stopped using diesel subs, there was virtually no aspect of operations or technology where I couldn’t go into considerable detail. When Ned Beach wrote Run Silent, Run Deep back in the early 1950s, he had to leave out a lot of that detail, because a lot of it was still classified. Interviewer: I presume you feel technically accurate is important? JTM: Naturally. Sure, the majority of people who eventually read Bacalao have never served aboard a submarine of any kind, and you could say just about anything and they’d buy it. You see that in movies all the time. People on movie boards passionately defend U-571 as being a great U-boat movie, even though it has about as much resemblance to reality as Barney does to a real Tyrannosaur. A lot of people don’t care about authenticity as long as they get an exciting story and, in a film, lots of noise. But the real submariners do notice errors, even little ones, and you want them to be able to enjoy the story too. Interviewer: And these errors would detract from their enjoyment? JTM: Sure. Suspension of disbelief has always been the basis of fiction. You let yourself forget about reality for a while and enter a made-up world, where you can enjoy the adventures of the fictional inhabitants. But then someone says they’re going to fire a Mark 14 electric torpedo at a ship. For the non-technically minded, no problem. For the old bubbleheads, reality comes crashing back at that point, because there’s no such torpedo. Mark 14 torpedoes were wet heater types. They ran on steam. The electric torpedo was the Mark 18. So, for the knowledgeable, you need to get these details right. Then they can forget about them and just enjoy the story, which they seem to be doing if my mail is any indication. Interviewer: Is there another novel in the works? JTM: There’s always another novel working its way up from the back of my mind. Nothing has quite jelled yet, but I have a rough idea of what I’ll be going. Interviewer: Where will that be? JTM: Back under water, and back to the Pacific. That’s about as detailed as I want to get at this time. Interviewer: Are you working on anything else? JTM: Mostly the patrol report series. Currently, I’m just about done editing and laying out Cod’s fifth war patrol report. She made seven, so there’s two and a little to go before that book can go to the printers. It’s going to be a longer book than the first in the series, Wahoo, even though the number of patrols is the same. Cod’s commanders, at least Dempsey and Adkins, wrote longer reports than Kennedy and Morton. Interviewer: When can we expect that book to be out? JTM: We’re hoping for sometime in April.